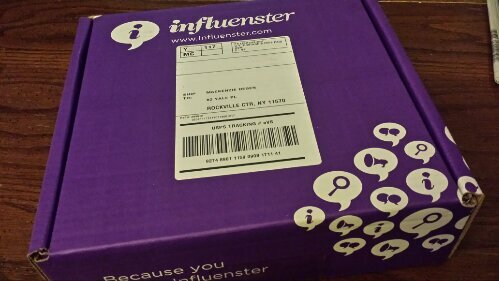 So every once in a while, I get chosen for a complimentary box/product review for Influenster! 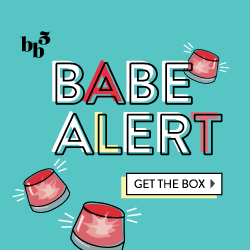 They compile boxes with products and then send surveys out to see if they can match the right audience to the right products. They chose me for the Violet VoxBox, and so I received this package in the mail and dove right into it! They include an information card with details on all the products, which is helpful in case you want to order or learn more. Here’s the first look! 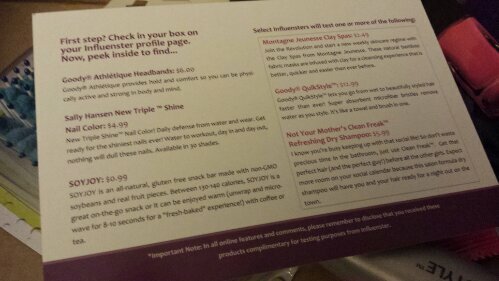 My big purple box contained 4 products: a mix of beauty, food and health/wellness! 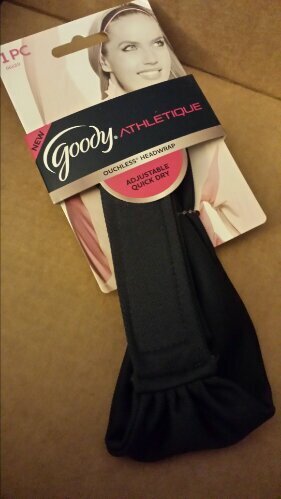 First up is a Goody Athletique Adjustable Headband in Charcoal Gray. This is great for working out as you can adjust it (so it won’t ruin your ponytail) and is make of a sweat-wicking material. 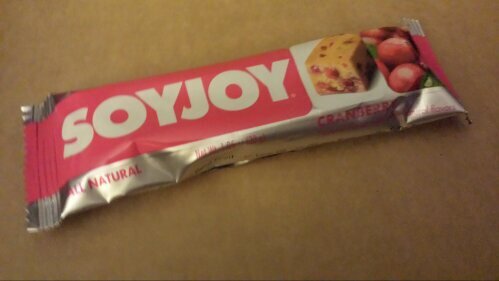 The next item is a Soy Joy Bar in Cranberry. I’ve had Soy Joys before and I’m just not a huge fan. They’re kinda small, chalky and just sub-par in comparison to other breakfast and snack bars I’ve had before. I mean, they’re edible and good if you’re on the go, but I would not purchase them myself. Here we have Sally Hansen Triple Shine Nail Polish. This bright, bold pink is attention grabbing to say the least, and applies well. In general, I have many pink polishes already so I would have preferred another color, but to comment on the quality of the polish- I would recommend it. 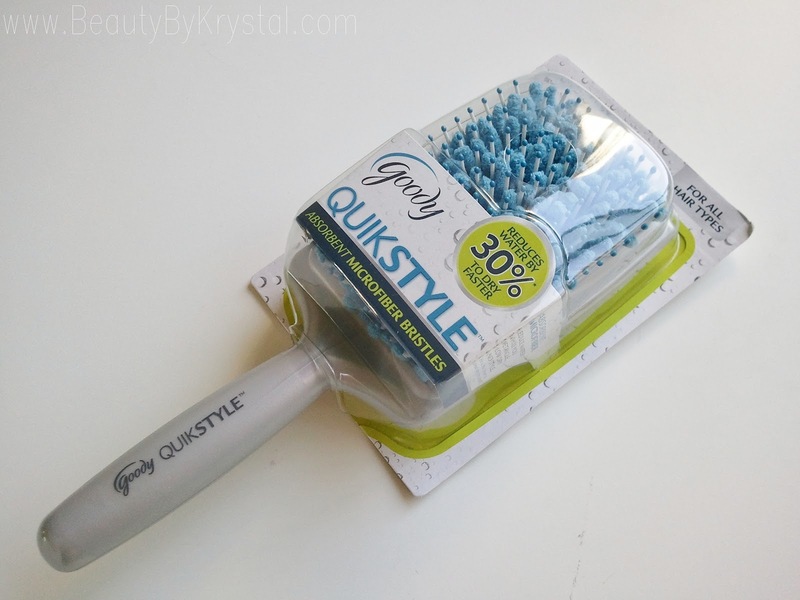 The final item is a Goody QuickStyle Hair Paddle Brush. This is quite an interesting item as it feels like a plastic brush mixed with a dusting glove. 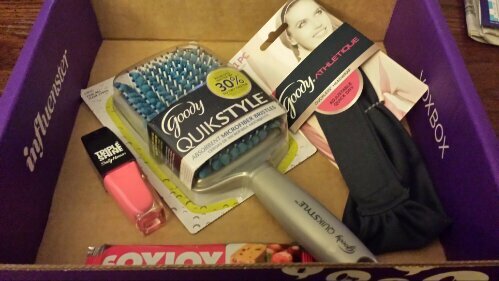 On their website, Goody writes “Go from wet to beautifully styled hair faster than ever! Super absorbent microfiber bristles remove 30% of water as you style*. It’s like a towel and a brush in one. ” In my opinion.. it kinda hurts. The plastic bristles are really stiff and it feels a bit unusual brushing your hair with it. On the positive, it does help to dry your hair quickly! 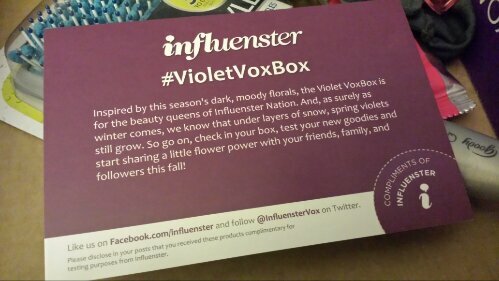 All in all, this wasn’t my favorite Influenster VoxBox, however I like that it had a health, beauty and wellness theme to it.